Well, my "bag of tricks" was emptied today. I came to my last Thanksgiving craft today. 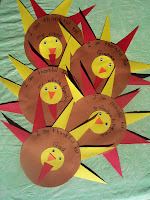 We made a thankful turkey using circles and triangles. It's always a little difficult getting the children to tell you what they are thankful for. After they hear the first child's thankful thought, you get a lot of repeats. 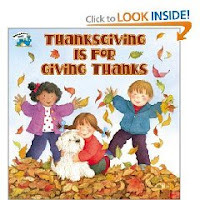 I reread the story "Thanksgiving is for Giving Thanks, " by Margaret Sutherland, that I read the other day to try to give them ideas. F irst you will need a large circle cut from the brown paper. If you have children that are old enough you can have them cut the circles out themselves. I already had ours cut. I cut triangle feathers from the yellow and red paper--the paper cutter comes in handy here. Then I had a yellow circle for the head, an orange triangle beak, and a red triangle wattle. On the back of the circle I have the children put glue in a semicircle along the edge. Then they glue the feathers on--I let them do as many or little as they like, and whatever colors they want to use. Next all the rest of the pieces get glued on--the circle head, triangle beak, triangle wattle, and wiggle eyes. 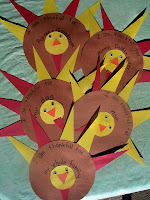 Finally I ask the children what they are thankful for and I write that in the middle. 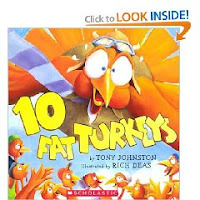 The book I read today was called "10 Fat Turkeys," by Tony Johnston, illustrated by Rich Deas. It's a cute story of 10 turkey doing silly things and counting backwards to--NONE. It also has rhyming prose which makes it fun. If I had more time, I would have loved to put up 10 of the children's turkeys and remove one at a time as we read, to help with counting backwards. We used our fingers each time, but it can get confusing with little ones. Sometimes that time aspect can be a bugger. They had fun though, with lots of giggles. I could've written the same thing about how hard it is to get them to tell you what they are thankful for. And yes, like you, I've found that if they are hearing the other children's answers, they will say the same thing. I have to do it this week and I'm bracing myself!